Ross County manager Jim McIntyre believes referee Craig Thomson blundered by awarding Dundee a second half penalty in an incident that also saw Staggies defender Andrew Davies sent off. The sides drew 3-3 as County extended their unbeaten run to seven games. But they had to settle for a point that sees them slip to fifth place in the table. "There's no doubt the sending off changes the game," said McIntyre. "It was frustrating as we were 3-1 up after some great goals and we looked a real threat." Ross County were leading 3-1 after 53 minutes at Dens Park when Davies clashed with James McPake in the visitor's penalty box and the official immediately pointed to the spot. Davies, who had previously been cautioned for a first half for a foul on Greg Stewart, picked up a second yellow card and the red that sees him miss the Highland derby against Caley Thistle. Rory Loy scored then went on to claim the equaliser with Ross County having to dig deep to secure the draw and Thomson's decision clearly annoyed McIntyre. "Andrew Davies has had two challenges in the match. The first one is a definite booking and we have no complaints about that," McIntyre told BBC Scotland. "But the second one is very soft. I think McPake goes down looking for it rather than him being pulled to the ground. "That was really disappointing considering there was five or six challenges from Kevin Thomson and he never seen red. That was annoying. "It was very soft and if we were to give penalties for that every day of the week then we would be giving a lot of them, but for me it's not a penalty. "The most pleasing thing for me was the character we showed, especially when we went down to ten men, but you have to credit to Dundee as they moved us around well with the man advantage. "But, overall I'm delighted we have kept the unbeaten run going, especially in the circumstances as we had to be resolute and we certainly have great spirit in the camp." Both teams were led on to the pitch by a piper as the club paid tribute to the "battle of Loos"
Dundee manager Paul Hartley was also left nursing certain frustrations despite his delight at the way his players fought back to nearly win the game at the death. He was unhappy with the quality of Dundee's defending in the first half following their six goal hammering at Parkhead the previous week. However, he was delighted at their attacking verve with a fit again Rory Loy marking his home debut with a double and Aston Villa's on loan teenage midfielder Riccardo Calder also impressing. 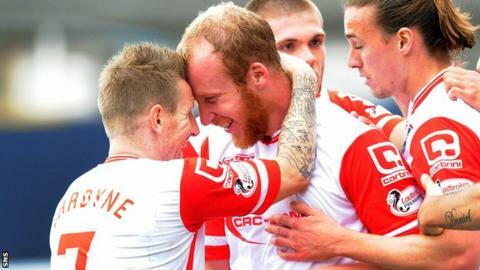 Hartley said: "I wanted a positive reaction after what happened to us at Celtic Park and I certainly got that today. "We actually the started the game very well but found ourselves 3-1 down through poor defending, but we said to the players at half time we wanted a reaction to that. "They gave me that and we could have actually won the match in the end as some of our game was excellent and we created great opportunities to get the three points. "Even in the first half we had good chances but the pleasing thing was the way we fought back today. "That was the first home game Rory has appeared because of injuries as all his previous games have been away from home. "He showed the home fans just how sharp he is and if we have him, Kane Hemmings and Greg Stewart all fit then we have a real attacking force now. "Young Riccardo Calder also impressed on his first start as he brings pace on the left side and his use of the ball is really good for a 19-year-old. "We thought we would throw him in from the start today and he handled the occasion really well so there is a lot to be pleased about."